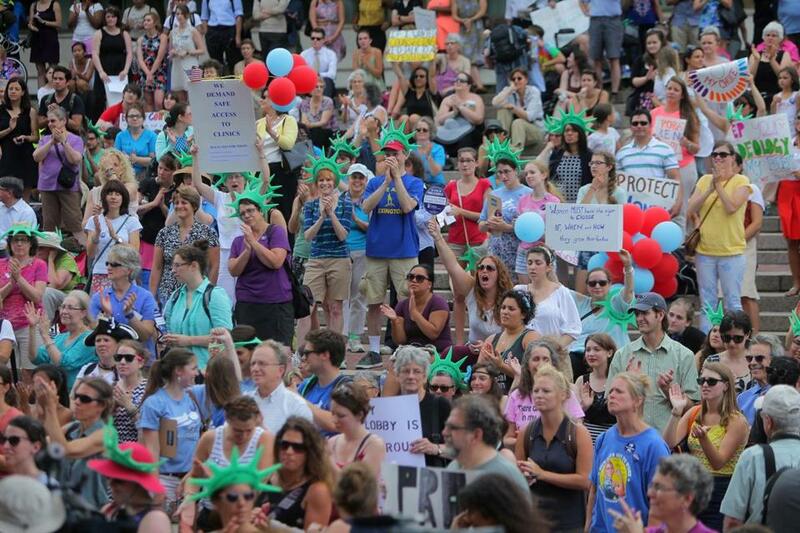 A large and vocal crowd attended the Supreme Rally for Women’s Equality on City Hall Plaza on Tuesday. Governor Deval Patrick told an energized crowd rallying in support of access to contraception and abortion Tuesday to not be discouraged by recent US Supreme Court rulings. Cheers rose from the plaza, where the crowd had gathered to voice outrage at recent rulings that struck down a Massachusetts law banning protesters within 35 feet of abortion clinics and that approved of a religious exemption to the federal requirement that employers cover contraception in insurance plans. Patrick and state Attorney General Martha Coakley, who is seeking the Democratic nomination to succeed him, have called for new legislation to crack down on harassment and obstruction outside abortion clinics. Speaking among dozens of elected officials and candidates at the Supreme Rally for Women’s Equality, which was organized by NARAL Pro-Choice Massachusetts, Planned Parenthood of Massachusetts, and a host of other groups, the state’s first African-American governor compared the rulings to earlier decisions from the nation’s highest court. Coakley told the crowd of women and men, “Let’s just not get angry — let’s get even.” She said the decisions are among many obstacles impeding women’s efforts to achieve full equality with men. “For women, it’s always been a little bit harder, and what the Supreme Court did last week certainly makes it a little bit harder still,” she said. The letter, signed by three of the group’s leaders, called out Coakley for her support of the previous buffer zone law. Outside City Hall, though, among the men and women, gay and straight, of many ages, ethnic backgrounds, and communities, there appeared to be a unified opposition to any government action that would inhibit a woman’s options. Judy Otto was among a group of about 50 Lexington residents who traveled to the rally on a bus. She said she recalled the days before the Supreme Court’s1973 decision in Roe v. Wade gave women access to legal abortions.